Totem Portrait Paintings, mine and yours?! It all started in my soul-awakening year as a self-portrait showcasing and channeling in my own inner animal spirit guides. As I worked through the process of re embodying my artist self, the portrait evolved and began to teach me how to truly listen to the Otherworld. 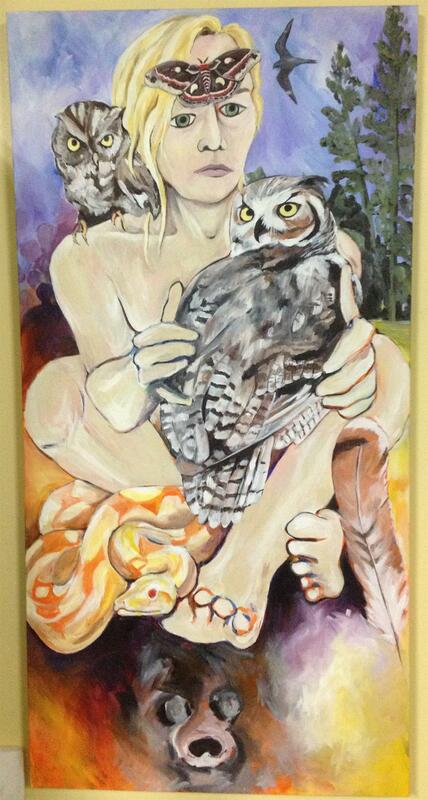 She is alive with continued evolution, holding the story of my soul awakening and is amply called Owl Girl. Part of my process in creating her was tracking the layers that emerged in photographs. This resulted in a rich conversation that has me loving the visual unfolding and prompted me to begin to track subsequent paintings in this way. Below is the current manifestation of Owl Girl. Upon sharing her with my village I was asked if perhaps I would be willing to channel a portrait for another from one of my brilliant human wilderness soul guides, Jade. I said yes, and thus began working with another, in collaboration, to create my second totem guide portrait, my first for another person. This adventure was explorative and rich, with great learning for both of us, I believe. During this year plus process I tracked the layers in image and created a slideshow showcasing the major transitions and giving her a visual memory of the unfolding. Some animals barged in and claimed their space while others drifted, nudged and claimed, only to be fully willing to step behind to allow the next layer. Each time I trusted the process, if sometimes a bit reluctantly, new knowing came. Often for both of us. I call the piece Jade’s Offering…she may call it something else. But with her full permission I share both the video and the finished piece with the offer to step into this creative totem portrait relationship with another person who is called to ask. To read what Jade had to share about her experience, check out her amazing blog post called Exposure here. The process is organic and may take as little as a few months or as long as a year (Jade’s took 18 months, but I was in a deep artist claiming process being guided by both her and our collaboration so it feels safe to say the average time would be 6-8 months, up to a year give or take)… there will be a certain amount of storytelling and requests for images that touch you, etc. I will spend countless hours channeling the painting and will communicate as clearly and often as I can what is unfolding in both directions. The final 24” x 48” Thick edged wrapped canvas painting will be yours, along with a slideshow of the process. This offering is one I can only create with a single person at a time. The way I work is ever evolving and intuitive, but my intention will be for us to spend a bit of time in deep conversation exploring if this process is right for the two of us before committing. At this time I am charging $3000. Payable in installments (to be decided depending on your needs) with a deposit of $1000 before I begin ($500 is non refundable and covers supplies). My intention is that we will be very clear this collaboration is right for both of us before any financial commitment is made. I am also open to negotiating payment on a sliding scale if it is our destiny to explore together in this way and cost prohibitive. Please contact me here or via phone at (707) 367-1428 if you are intrigued, I know I am! Owl Girl Art is a Liminal space in between worlds where creativity and conversation with soul takes place. It is a place and not a place. It is symbolic of our ever illusive but absolutely essential desire to create. Owl Girl Art is a precarious label that speaks of this “place” in me. I know, you might be thinking, “what the hell is she talking about?” I often think that myself, but here is MY truth. I am a medial artist and transformative art teacher who believes the very act of creating changes the world in often inconceivable, unquantifiable ways. When we let our minds quiet and our hands create from the place of uninhibited imagination, our Soul can step into consciousness in new and often profound ways which not only connects us to our inner knowing, but to the vast collective of which we are an essential part. Creativity is medicine for our wounded world. Dena Watson-Krasts (that’s me!) has been working as a top floral events designer for over 25 years. Recently she decided to step out of the chaotic events world in order to channel her creative force into the deeper, less explored world of the Soul. In addition to her design background, she has taught a variety of fitness classes over the years that have helped her to develop an embodied somatic approach to Pilates and movement. Therefore, she is also an explorer of visceral knowing and employs these embodied practices to create unique, expressive and healing experiences with and for her clients. Dena carries Bachelors of Arts in both Studio Art and Art History and Visual Culture from University of California, Santa Cruz. She currently is studying Depth Psychology at Sonoma State University, scheduled to graduate with her Masters in Psychology, emphasis on Depth in May of 2016. Her calling lies in creating unique healing experiences through the creative process and/or somatic awareness in service of the Great Mystery. Please stay tuned and check back often for updates as this site is still unfolding with many offerings to come. For now, consider joining us for a day of Liminal Art in Ukiah on July 18th!